Today’s entry focuses on a very special creation from the world of gourmet burgers; the Pretzel Burger from Westchester Burger Co. Lets begin with the burger’s namesake, the Pretzel bun. The bun was quite good; soft, but firm, with the classic pretzel taste we have all come to know and love. The burger itself was of fine quality; cooked rare (by request), it was seasoned well and was perfectly juicy. 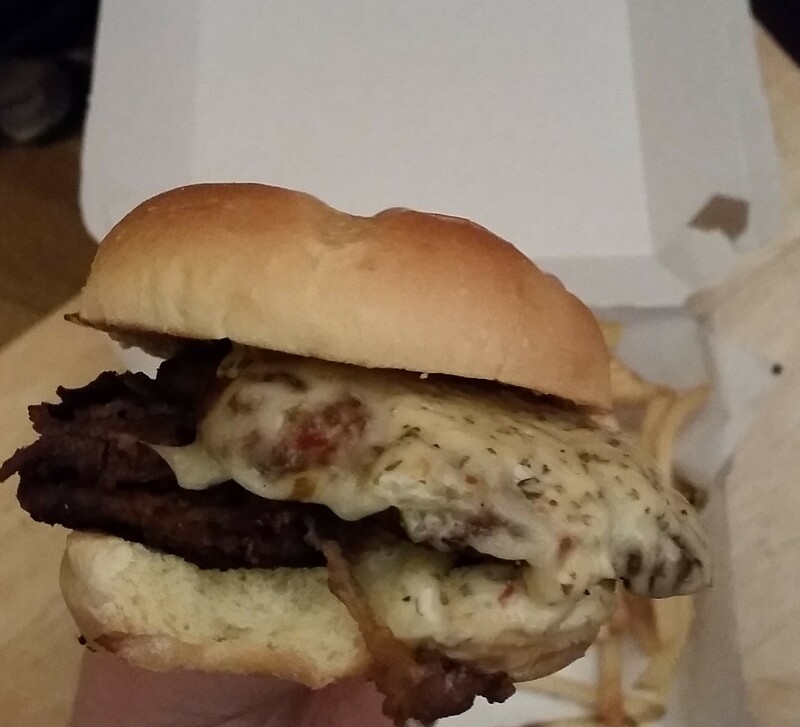 The melted cheddar cheese was smooth and added a nice semi sweet flavor to the meat; but what stood out apart from your normal burger elements, were the great choices in toppings. The bacon was exactly what you wanted on a burger like this; not only did it have a nice crisp on it, but the grease and fat content it boasted were as good as you are going to get anywhere. What also made this bacon special was the fact that it was maple bacon; at first I thought they had literally drizzled maple syrup on my burger. Alas, that was not the case, but the bacon supplied a very nice maple syrup component to an already tasty burger. 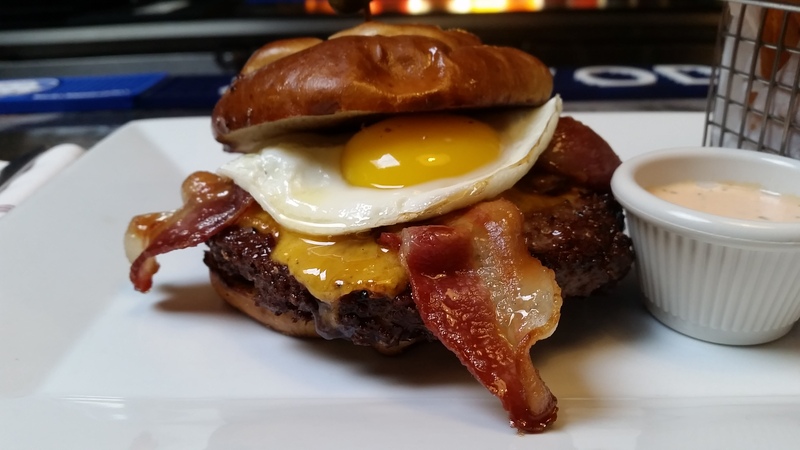 The egg is the final element that makes this burger so special. Admittedly if you were to ask me what toppings should go on a burger, egg would not be my first choice; but in this case it totally worked. The egg provided a welcome taste and texture of custard, and the runny yoke was both messy and delightful. Westchester Burger Co. definitely knows how to make a great meal; not only is their Pretzel Burger a king in the world of burgers, entirely worthy of the term gourmet; but their side dishes are great as well, as I enjoyed my burger with a nice addition of crisp waffle fries with spicy ranch dipping sauce…delicious. 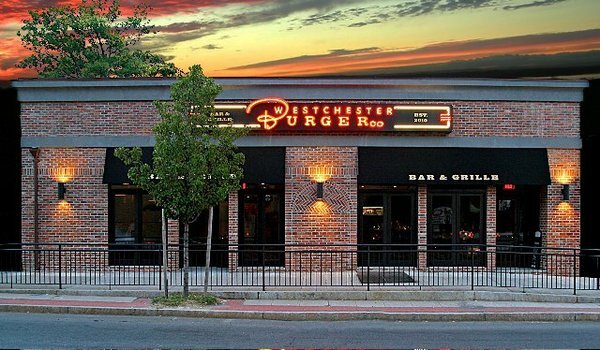 If you like burgers and more importantly, burgers that taste great, Westchester Burger Co. is where you need to go. They have three locations spread around the county; you have no excuse not to. The world of pizza is vast and diverse; it includes slices with cheese, without cheese, with sauce, and without sauce. But when someone thinks of pizza sauce, it is usually some variety of tomato that comes to mind. That is why it is such a nice change of pace when a pizzeria goes a different route and uses vodka sauce instead; and Luca Bella does so exceptionally well. This slice is interesting in that its somewhat a mixture of both traditional and Sicilian slices; it has the shape of a Sicilian, but the thin crust of most “traditional pizzas.” The flavor and texture are both spectacular; the crust and shape combination allows you to gain a good grip on your slice (what we in New York call “the fold”) and the cheese was its usual enjoyable self, but it was the sauce that was the real star here. Now I am Italian, I love pasta, and I cannot tell you how many times I have had Penne alla Vodka; Vodka sauce is in my (proverbial) blood. It is with that background in mind that I say that I have never tasted a vodka sauce better than the one at Luca Bella; and it keeps me coming back for more as it is rich, creamy, and slathered all over the slice. It is literally a taste that, during consumption, you wish would never end. 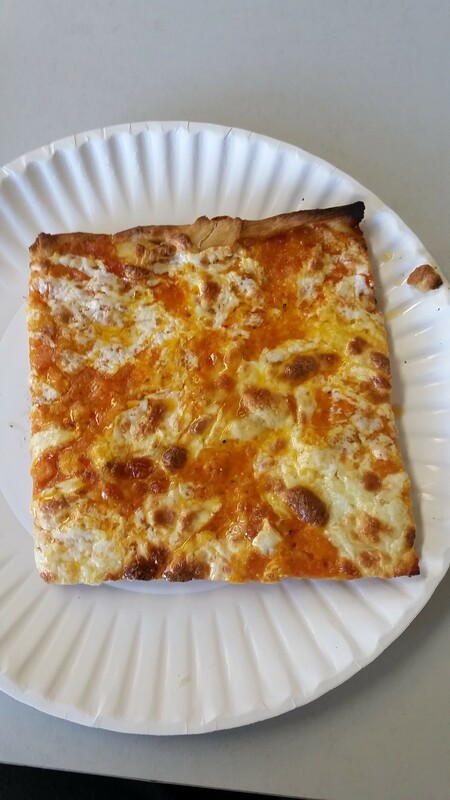 So as usual, Luca Bella’s Vodka Sauce pizza gets my stamp of approval; and if you are in White Plains and yearn for something both delicious and different, well, you know where to go. “Hold up a minute, you mean to tell me you are covering a chain restaurant?” Yes I am, and it is a very rare occurrence indeed; I can also guarantee that I would never do this for a chain’s signature food (i.e. the wings from Buffalo Wild Wings) unless it was a signature challenge. But, since this happens to be a very good burger from a wing joint, I deem it wholly fair to review. Buffalo’s Juicy Steak Burger comes with two patties, multiple slices of sirloin steak placed between them; pepper jack cheese, an onion ring (on top) and your choice of signature sauce; the sauce I chose to employ was of the Parmesan Garlic variety. The bread was soft, and the patties themselves were tasty, if not inspiring; but what really made this burger pop was the combination of sirloin steak and choice sauce. As promised, the sirloin was indeed juicy; and the change in texture between patty and steak provided a nice diversity of meat. The sauce itself was deliciously sweet and garlicky, albeit with a bit of a bite; and it also provided the perfect mild heat that really set this burger apart. My goal with these reviews is to illuminate as many of the best local eateries as possible, not to glorify big food chains and corporations. 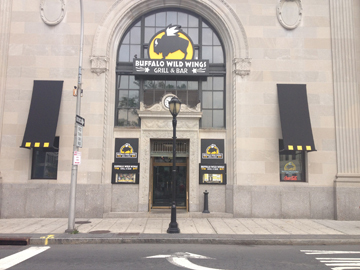 However, when a chain produces a quality product that deviates from the norm, it certainly must be recognized; and that is what Buffalo Wild Wings has done here. 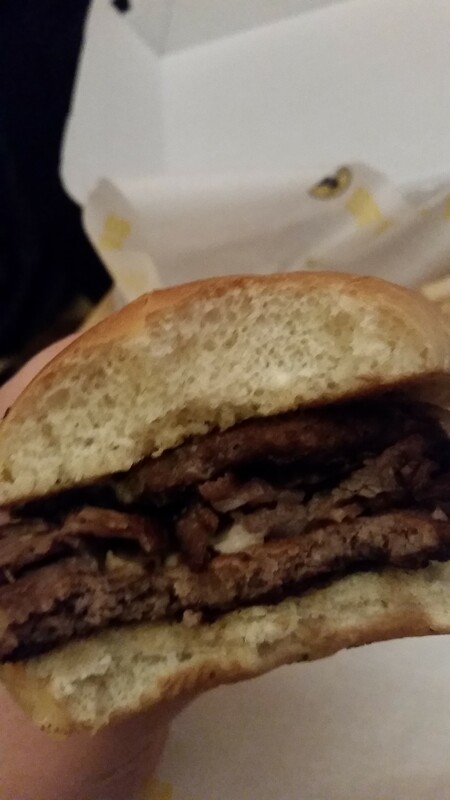 So if presented with the opportunity, I recommend that you try a Juicy Steak Burger from Buffalo Wild Wings. 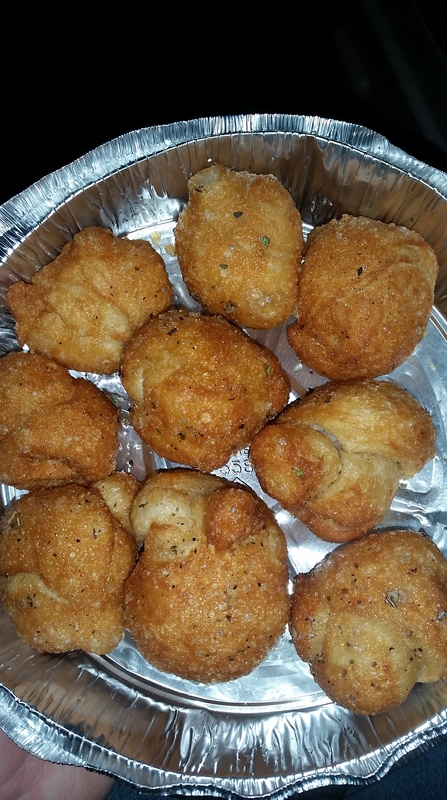 Today’s review is a little different as it will be my first ever review of a side dish; namely, Garlic Balls from Pizza, Pasta, and Things (which can be found in both Port Chester and West Harrison). Now some of you may have immediately thought of Garlic Knots, and if so, you need to put that completely out of your mind; because Garlic Balls are a different, and more delicious animal than are Garlic Knots. Full disclosure; you have not had a true pizza experience until you have had Garlic Balls with your pie/slice. So I know you are wondering how they taste, right? The outside “skin” of the ball has a light crisp to it (you will hear a crunch of sorts when you bite in), but at the same time is soft, doughy, and lightly moist. There is a definite element of grease there, but it is in no way overwhelming; and the flavor combination is a complex and thoroughly enjoyable one. PPT’s combines their seasoning generously to bring about a taste that is garlicky, sweet, and even a bit buttery. Garlic Balls are a rare treat that breaks away from the traditional Garlic Knot, and is a side that will always leave you wanting more (and that’s not a bad thing); so when you have a chance, treat yourself to a nice order of Garlic Balls down at Clino’s or Michelangelo’s Pizza, Pasta, and Things. 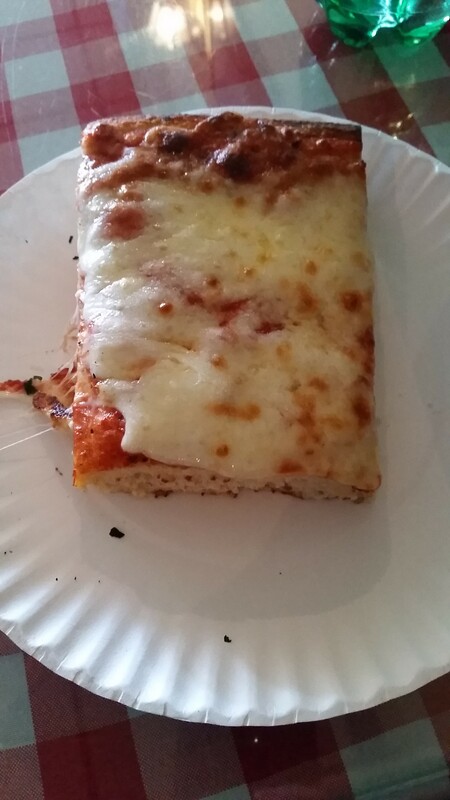 There are certain key elements that go into making a good Sicilian style pizza; first the crust must be firm enough to hold its shape when picked up, but soft enough to give you a full, doughy bite (think of a pillow of dough, as opposed to a pillow of cheese). Second, the sauce should be spread out evenly enough to lubricate your mouth with each bite; and finally the cheese must be melted in such a way that it stays on the pizza when you chow down. I once visited a hole in the wall pizza shop (if you could even call it pizza) that served me the exact opposite of what I’ve described. The crust was too hard, the sauce was cold (after being heated up! 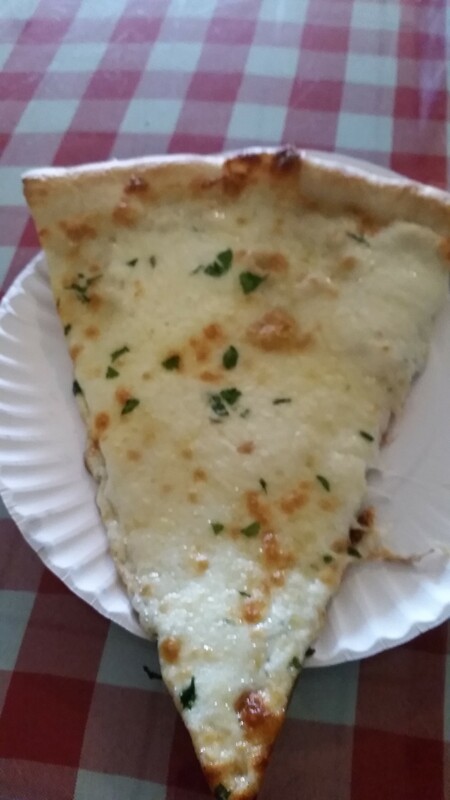 ), and the cheese was hard and slid off the slice after one bite. Last time I checked, this shop had closed down and Tarantella is still going strong; why? Because Tarantella knows how to make a proper Sicilian. Soft pillow of dough? Check. Melted cheese that actually stays on? Yep. Enough tomato sauce to compliment the other ingredients? You bet. This particular slice also had a nice crunch that started the closer you got to the crust. A crunch that was not the result of too hard a crust but rather just the right amount of time in the oven; and as usual, the the taste was just as good as the texture. If you have never had a Sicilian before, you are missing out; this style takes the traditional taste of good pizza and applies it to a thicker canvas, putting a nice spin on an already great work of art; and quite simply, if you want to experience one of the best artists in the business, you must go to Tarantella Pizzeria in Nyack. 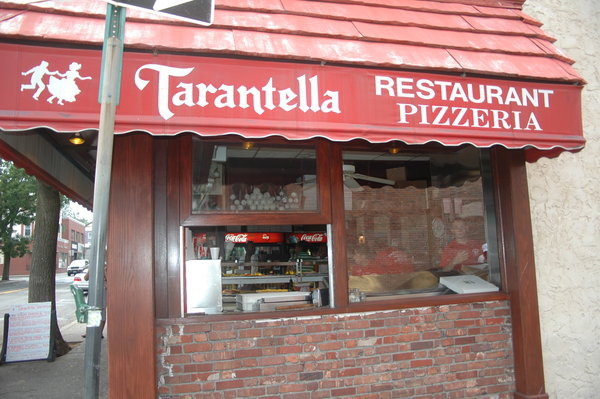 Tarantella Pizzeria in Nyack makes the best pizza I’ve ever tasted; I have had White Pizza from many different locations and while other vendors are really good (its New York after all), no one does it better than Tarantella. Now there is nothing “wrong” per se about a slice of pizza with a cheese “puff”, as they can be very tasty, but I have found that the best White Pizza, like Tarantella, avoids that method and instead gives you a straight forward White slice. 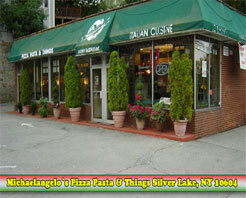 Trust me, if you like White Pizza and have the ability to get over to Nyack any time soon, do it; I have brought out of town family and friends there on multiple occasions, and hear nothing from them but rave reviews.